The Wilds has always held a special place in our hearts. It was there that Dad made sure of his salvation while attending camp in high school… one of our aunts trusted Christ there as well… and it has been the location sparking many precious memories for our family through the years. A few weekends ago, we were blessed with the opportunity to attend Family Camp with the entire family, Matthew included! It is hard to describe the joy of being there once again… everything was so familiar, yet, as it had been several years, there were many new changes to explore. It was truly like going home. The Lord used the weekend away from the race of normal life, surrounded by glorious creation, God-honoring music, and sound preaching, to refresh our hearts and renew our energy for the events and duties before us. An evening in the CoolBeans coffee shop, enjoying our favorite ~ Raspberry White Chocolate Mocha Freezes! Since living in a duplex once again was so wonderful, one of our “littles” made a hilarious contribution to the experience. Time to fellowship with our friends on staff was a tremendous highlight! On Saturday afternoon, every forecast was predicting rain in high percentages, but the Giver of all good things saw fit to astound us with His goodness once again by clearing the skies and giving beautiful sunshine so we could enjoy time in the fresh air together. Time for two of the dearest couples on earth to talk heart-to-heart! Give your day to the Lord. From eternity past He has lovingly, sovereignly planned out each second of which it is comprised, so trust Him. Realize that when circumstances or individuals in your life seem to be hindering the way you think things ought to come together, it is not really them obstructing your path – they are merely instruments under the direction of the great Conductor Who is working all things into a symphony of praise and glory. Rest in Him, and listen for the music. At the end of time, will we receive the crown of righteousness at the hand of our righteous Lord as a reward for loving His appearing? In our day and age, where is the comfort found in I Thessalonians 4: 17-18? “Then we which are alive and remain shall be caught up together with them in the clouds, to meet them in the air: and so shall we ever be with the Lord. Wherefore comfort one another with these words.” In contrast to this, have we simply made ourselves comfortable in our daily lives, enjoying what prosperity brings us and reveling in what the world gives, rather than in what our relationship with Christ gives? A couple of weekends ago we were blessed to have the opportunity to host the 2013 NC FEW Conference. It was a blessing and encouragement to be challenged in your relationship with Christ, your family, and others as we were taught from the Word of God and fellowshipped with each other. The goal of the Family Encouragement Weekend was once again played out as many like-minded families joined together in the name of Jesus to encourage each other, learn from one another, and pray together. Praise the Lord! 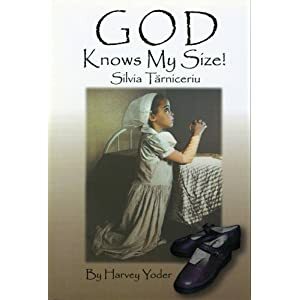 At the beginning of this year, I read a fascinating book about Silvia Tarniceriu called God Knows My Size. For school, I wrote a book report on it, and I thought I would share it with you. Silvia Tarniceriu was born and raised in Iasi (pronounced Yahsh), Romania, and was the eighth child out of twelve children. Her father’s name was Pricop, and her mother’s name Elena. Because they were such a large family in communist Romania, it was hard for her parents to provide for them; therefore, many of her older siblings had to quit school and get jobs to help provide for the younger ones. When Silvia was twelve years old, her tata (papa) took a trip and decided to take her with him. On the way,they stopped to see his sister, Estera, and while they were there, she and her husband convinced Tata to leave Silvia with them because they could better provide for her. She stayed with her aunt and uncle for one year and then went back home to Iasi. One night when the Tarniceriu family was in church, the pastor said that God can do anything. This was very hard for thirteen-year-old Silvia to believe,and she decided to find out for herself if this was really true.That night when she was in bed, she asked God for a winter coat, a sweater, and a pair of shoes. (All three of them were basically impossible to purchase in such a large family at that time.) Then one day her family received a package in the mail that had all three items in it, and they each fit Silvia perfectly! From that time on, she never doubted God again and trusted him as her personal Lord and Savior! When Silvia was older, she helped smuggle Bibles, but eventually was put in prison and persecuted for her faith. The only thing that kept her true to her Savior was the promise that “God knew her size” and that he could/would provide for her. After her release in 1983, she gave up her Romanian citizenship and moved to America. She was finally in a free country! There she got a job with “Christian Aid Ministries” which is a ministry for Christians in Romania. Silvia could help the Christians in her country at last! Silvia Tarniceriu is still living, and shares her testimony at various events across the United States. For nearly fourteen years, someone was dwelling in our home and family, of whose true personality and perspective on life we knew but little. Then, something happened, and out she came! Penguin-loving, laugh-inspiring, and thought-provoking, Victoria brings such joy to all of us with her unusual and often unbelievable sense of humor! Recently, however, yet another new side of her has emerged. We have discovered that she is quite the poet (and always seems to have the perfect proverb or line of rhyme to share at any given situation). Typically written late at night, while she is comfortably ensconced on the floor in my room, her poetry has greatly blessed and impressed me. The other night she shared this one with Jessi and I, when, as usual, she was journaling on the floor between our beds. I loved it! I’m sure I’ll have to post additional compositions in the future, but for now… enjoy! At once I realized that was no curse. When words own color and careful use. While useless words are all discharged. Without it, sentences will sound discordant. Here we’re in danger of sounding withered. They’re an accent to your voice. Ships don’t sail on shallow seas. Don’t just robe in useless clatter. That we may speak and words may hear. To edify God’s chosen jewels. For they are a sacred trust. Speak the words which spread the Light. Our “good name” this form will share. Speak with feeling, depth, and love. Brothers, both biological and within the body of Christ, are a blessed gift from the Lord. A visit from two of the Barnes guys. Though the whole family was unable to come up, Tim and Wes came for a brief but great visit last weekend. Outside work, music sessions, games, fellowship, shooting, laughter, and memorizing a portion of Psalm 20 filled the time and made for many fantastic memories. The birthday celebration of our manly brother Samuel! How we praise the Lord for the work He is doing in the life of such a dear brother! Happy Birthday, Herman! You bring such joy to our lives… we love you! Today marks the two-month birthday of the newest member of the Neely Team — Valiance (German Shepherd)! She came to us through a series of unexpected and pleasurable events, including a renewed contact, a family discussion, and a shocking(!) conclusion. Arriving as a small bundle of squirming fir, Valiance brightened our day and lives with her many bright and winsome ways. We love having a puppy around again, with all of the entertainment, opportunities, challenges, and joys that she brings. A few weekends ago we were blessed to take a trip down to south GA with Matthew to see Grandmama and Uncle Fudge, as well as our adopted grandparents, “Uncle” Bill and “Aunt” Peggy. Besides getting to spend quality time with these precious, godly older couples, our missions for the journey were to re-roof Grandmama’s barn, a rather daunting task when you consider that you only have two days to accomplish it, and to take some time to go hunting. The blessing of the Lord was upon the entire weekend. Early Friday morning, Matthew had the joy of helping his beloved Amanda take two deer from the woods! Following that excitement, work on the barn began in real earnest, and the Team set in motion. It’s amazing what a man can accomplish… when he has a hardy helpmeet by his side! Working together, the project was successfully completed in time to drop everything, clean up, and race off to a singing commitment we had Saturday night. (Whew! ) Praise the Lord! Before heading home, we couldn’t resist the opportunity to take a couple group shots. How grateful we are for the time to fellowship with and glean wisdom from these dear people! As we left Bainbridge, we took Matthew by the cemetery where Grandpapa is buried. Grandpapa’s life verses were found in Psalm 34, and following the Lord’s abundant blessings on our weekend, they seem very appropriate. What a heritage we’ve been handed!